For the month of March, I chose to bake Chocolate Cornets for the Baking Eggless Group. The original recipe was from a you tube video and we tried to change the recipe into an eggless one. Looking at all the creations of group members, I am really proud. Each and every recipe is great with nice egg substitutions and wonderful results. I thank all the members of the group who took part in his month’s challenge. I will provide a link for every recipe along with the snaps. Take a look and enjoy. I will update this page when I get new entries. If you are interested in joining the group, please mail me to gayathriraani@gmail.com with your details. Nice roundup and looking forward to the next challenge..
Great efforts girls !! perfectly done and wonderful roundup !! Can u believe i make this just before 1 hour and i show this here ….. ur one is nice…Good round up. 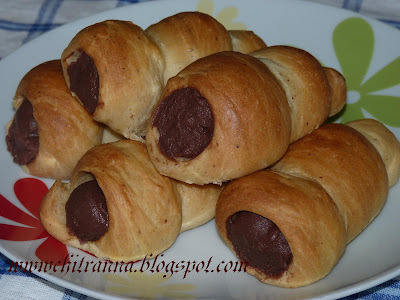 nice roundup and these cornets are so irresistable with chocolate nd cream oozing out. Beautiul cornets together, fantastic roundup..